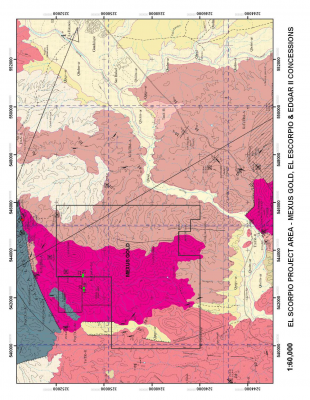 Report on Preliminary Geological Reconnaissance of the Scorpio_370 and 8 Hermanos area, Municipality of Ures, Sonora. 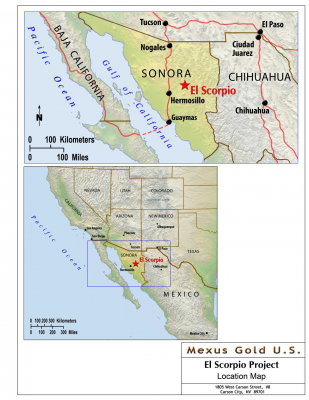 In addition to the Santa Elena and San Felix mines, MexusGold also owns the mineral rights to approximately 10,000 acres over 9 concessions near Hermosillo, Mexico. The concessions include the Ocho Hermanos, 370, San Ramon, Plat Osa, Edgar 1, Edgar 2, El Scorpio, Los Laureles, and MexusGold. The concessions are located in Sonora State in northern Mexico approximately 80 road kilometers northeast of Hermosillo, Sonora, Mexico near 29o 25’ North and 110o 35’ West. The property is accessed from Hermosillo by driving via good paved road to the town of El Scorpio and then for 15 kilometers over dirt roads to the prospects. The company is presently evaluating 2 concessions: the El Scorpio and Ocho Hermanos. A technical report was completed on the El Scorpio concession by geologist, Paul Pelke. The El Scorpio de Ures Prospects are located in Western Cordillera of North America. The entire project area is underlain by a sedimentary sequence consisting of quartzites, limestones and shales, intruded by dacitic and dioritic to granodioritic stocks. The contact zones are well metamorphosed (contact metamorphism). Later rhyolites appear to lie on top of the sedimentary – igneous – metamorphic package. Where observed, the sediments appear to be relatively flat lying except where disrupted locally by the intrusive bodies. In the mineralized areas, all of the prospects lie within altered portions of the intrusives or within the metamorphic halo around these intrusives. The extent of the metamorphic halo is not able to be determined at this point in time. The metamorphism is accompanied by alteration. The alteration types range from silicification, argillic alteration, propylitic alteration (chlorite and epidote), and finally surface oxidation. In places, the silicification is pervasive; however quartz veins and veinlets are also present especially in the 370 Area and in the El Scorpio area. The area is interpreted to be a copper porphyry system. The Ocho Hermanos concession is a high-grade silver property. There is silica with massive sulfur and limestone. There is a 30 degree mantle of unknown length that needs to be drilled. Geologist Elias Badilla has performed preliminary sampling with excellent results. The test runs on three kilos of sulfide ores showed 5kg to 27kg of silver per ton. The company is looking for an economical way to extract the silver. The plan for both concessions is to obtain the necessary permits to build additional access roads on both properties. Mexus looks to drill both concessions which will be the basis for a mining plan.